Although the field of business analysis is relatively young, its importance has been recognized in many companies. The CEO of masVenta Business GmbH, Rainer Wendt, and microTOOL’s Michael Schenkel sit down to talk about the IIBA Germany Chapter and break down what it takes to become a business analyst. Michael Schenkel: Mr. Wendt, you are the CEO of masVenta Business GmbH where you provide business analysis and project management expertise. You are also the president of the IIBA Germany Chapter, the German representative at the International Institute for Business Analysis. That sounds like a lot to have on one plate? Rainer Wendt: Yes, one thing that helps me deal with that enormous workload is passion, my inner motivation. I am convinced that business analysis is a key factor for successful projects – that’s what drives me. The IIBA Chapter is pursuing the goal of spreading the word about business analysis in Germany in the hopes that will reach similar penetration levels to other European countries like England. Michael Schenkel: You have been involved with business analysis for many years now. How does one become a business analyst? What kind of training do you recommend? Rainer Wendt: Before I make concrete suggestions about solutions, as a business analyst I start off by assessing the need. That’s what we do for our training projects, from comprehensive programs for companies all the way through to exclusive career plans for individuals. That includes an analysis of the organizational and professional context and the short- and long-term goals that the person, department or company is pursuing. Michael Schenkel: How does that look on a practical level? Rainer Wendt: A freelance consultant’s primary goal should be to get a business analyst certificate to spruce up her profile, to verify her skills to have a better chance of landing projects. To this end we develop an individual training project together with the consultant. A project like this costs time and money but it leads to results. So practically that means that the consultant needs to invest in her training to get the certificate. It comes down to a very rational cost/benefits analysis, as in every project. Michael Schenkel: And what kind of goals are companies pursuing when they train business analysts? Rainer Wendt: A possible goal could be to save money in business analysis and requirements engineering. In that case it is important to identify the weak points in the business processes and to tackle them in the places that will have the largest effect. Typical weak points are found when drawing up the documentation of the business requirements or the prototyping processes, to name two common examples. Just a few process improvements can lead to massive savings. Michael Schenkel: So in other words: business analysis and the improvement of processes go hand in hand? Rainer Wendt: Not necessarily, but generally, yes. A concerted business analysis training program always leads to improvements in the company and that is the overall goal. The quality of the requirements should increase, and the efficiency in capturing and executing them should be improved. That can only be achieved if existing structures and processes can be questioned and revamped. This mandate needs to come from management which is not a very simple task, that’s why we support different departments as they do so. Michael Schenkel: How can one become familiar with these kinds of topics and what kinds of standards are out there? Rainer Wendt: Just as in the area of project management, which is a far more established field, there are a number of standards in business analysis and requirements engineering. Here in Europe, particularly in the engineering hub of Germany, IREB (The International Requirements Engineering Board) has the so-called CPRE certificate, which is the most common qualification. But the syllabus doesn’t cover everything in business analysis because the CPRE certificate mainly focuses on functional and non-functional requirements pertaining to solution requirements. Many US companies are not familiar with IREB and CPRE and as such they are not accepted as a global standard. The same challenges are experienced by the BCS (British Computer Society) with their business analysis diploma. Michael Schenkel: So what is your recommendation? Rainer Wendt: We recommend training programs that are based on global standards of leading organizations in the fields of business analysis and project management. The IIBA offers a comprehensive program for business analysts. The IIBA will be expanding its program from two to four tiers to provide more options than the standard CCBA and CBAP (Certified Business Analysis Professional) certificates for people beginning their career as well as experienced senior analysts. Until now the CBAP was seen as the top global business analysis certificate even though there are only 6,500 certificate holders. If you compare that with the most popular certificate for project management, the Project Management Professional (PMP), which was awarded 700,000 times around the world, you can see how young business analysis as a discipline is. The Project Management Institute (PMI) now has it own certificate for business analysis, the PMI-PBA (Professional in Business Analysis) that is comparable with the IIBA certificates. The expected distribution is very promising due to the large number of PMPs that are beginning to engage in business analysis. Michael Schenkel: So you recommend certificates by the IIBA and PMI, e.g. the CBAP certificate or the PMI-PBA certificate? Rainer Wendt: Right, I recommend the global standards according to PMI and IIBA. The large, global expansion helps companies and individuals by the same measure, whether it be in recruiting or in improving internal processes. Michael Schenkel: How much do I need to invest to get a certificate like that? Rainer Wendt: The short answer is three months for certificates from the IIBA and PMI. The cost is between 400 and 500 Euros, and is similar among the different certificates. We have prepared the most CBAP candidates for their tests in Germany so we know how many preparation hours are necessary: typically between 100 and 200 hours. Michael Schenkel: I see you also offer courses online. How have participants responded so far? Rainer Wendt: Beyond the traditional class room format that can be found in public and commercial institutions, we have been offering certificate preparation online for the past three years. This format brings particpants and trainers together via web conferences; generally 6 participants for 3,5 hours on e.g. a Friday afternoon. It is working very well and is highly interactive. Participants save on travel time and costs. Many of them have told us that breaking the course up into six weeks has been very good for learning. They can master the topics better. They also have to do homework, which we are very strict on (laughs). Michael Schenkel: Is it true that the words business analyst still don’t appear on most business cards – instead words like business consultant or business development can be found even though they’re pretty much the same thing? Rainer Wendt: Yes, business analysis is not only carried out by “official” business analysts, it is often the key point in activities. For example process analysts are faced with challenges that the Business Analysis Body of Knowledge (BABOK) proposes solutions for. That includes an understanding of the company’s needs, the inclusion of stakeholders, the recommendation of appropriate solutions or the evaluation of prototypes and test cases, to name just a few important topics. It is apparent that these topics cover a wide range of roles in the company, from management to IT. Michael Schenkel: As the president of the IIBA Germany chapter you interact with many different companies. Could you tell us what we should pay attention to in the interplay between project management and business analysis? 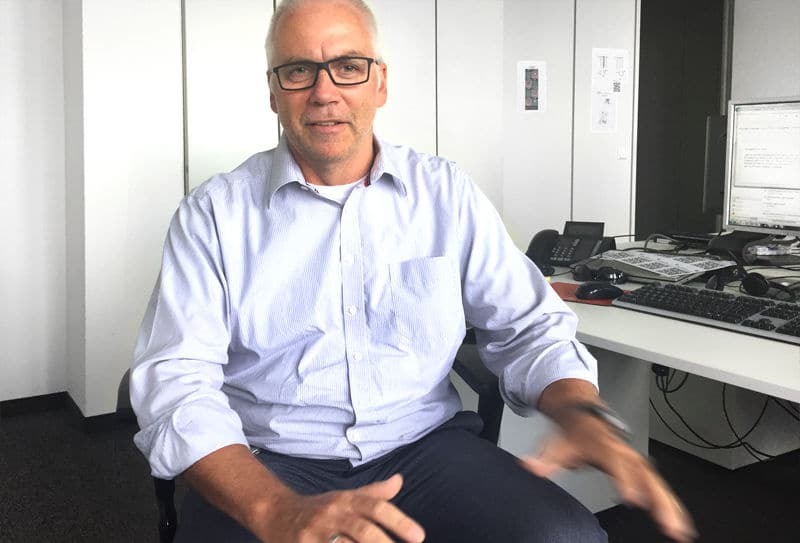 Rainer Wendt: In my experience as a business analyst and project manager over the last 30 years, I have learned from my mistakes. Without a doubt I can say that projects with imprecise goals, unclear or unstable stakeholder scenarios and poorly managed responsibilities will run into trouble sooner or later. Let’s take an appropriate tool like the simple RACI approach from BABOK, listed here as “roles and permission matrix”. Applied correctly this technique has the potential to work wonders because the interaction between different roles like “business analyst” and “project manager” are clearly understood. Furthermore, I would like to give you a tip that every project and every business analysis needs. Consider every project on an individual basis and always question the approach, make adjustments and tailor it as needed. Every project is different, every stakeholder is unique, there is no one-size-fits-all approach that will work in all situations. Michael Schenkel: Thanks for the tip. And thanks for an inspiring chat. Rainer Wendt: Thank you and see you soon. The next IIBA Germany Chapter Meeting, with a comprehensive program, takes place on 29 September 2016 at the offices of microTOOL. Information and registration can be found at https://www.microtool.de/en/events/iiba-chapter-meeting/.